How to write good ads. 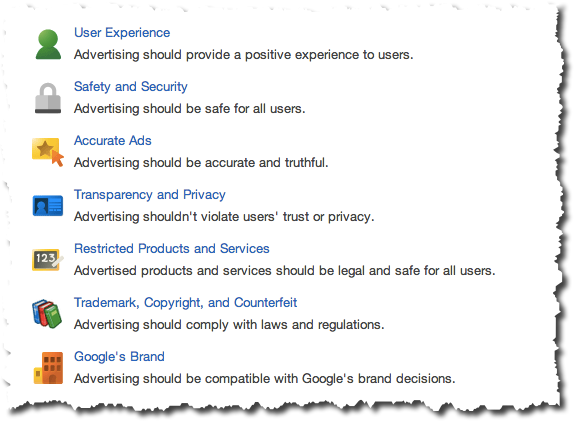 About Google's ad writing guidelines. Develop at least two versions of ads for the catering company, bike store, and online electronic store discussed in the previous chapter. Develop variations of your ad based on different sets of keywords (Ad Groups) which you have already generated for the above businesses. Accurate ad text: Your ad must reflect what the consumer will find on your landing page (e.g., your ad talks about yoga mats and if that item is not on your landing page or on your Web site, then Google can fall back on this rule if they want to disapprove your ad copy). Accurate Capitalization: You can capitalize the first letter of each individual word; however, you cannot capitalize an entire word with some exceptions (e.g., FREE Yoga Class will be disapproved since the word FREE is capitalized. However, Free GRE or GMAT Class would be acceptable as these are acronyms). Proper Spelling and Grammar: You cannot have misspellings in your ad copy (e.g., Luv instead of Love). However, alternate spellings are acceptable (e.g., color and colour). Unsubstantiated Claims: Unsubstantiated claims are not allowed. For example, you can not use superlatives such as "the best coffee in the world" in your ad copy unless such claims are substantiated with proof available on your Web site. Also, if you quote a price or special offer, then you must show the same to the consumer on the landing page or a few clicks from your landing page. Formatting and Punctuation: Your ad copy can have only one exclamation point and that exclamation point cannot be in your headline. You cannot repeat the same word multiple times in the same row (e.g., Free Free Free, will not be allowed). Miscellaneous: Your ad text cannot contain any offensive or inappropriate language. You can not imply a Google affiliation or relationship that does not exist. Analyze the ad shown in the example 2 and use all notes on section 4.1 points to compare the two different versions of this ad. Headline is too generic. Headline focuses on the specific offering and core selling points. No key words in the headline. Headline contains relevant keywords. Description talks about the value proposition. More poweful call to action required. Terms such as "best price in town"' and "get beans" are vague; more specific call to action is required. Landing page is specific to gourmet coffee page. Landing page is just the home. You offer computer maintenance services specializing in recovery of data due to computer failures and viruses. You have a strong presence in the northeast region. You offer consulting services and training for Google Analytics. You can deliver training nationwide via online classrooms. You are a real estate agent licensed in New York and you would like to promote your services to first-time home buyers. Ad Title or Ad Headline 25 with spaces. Description Line 1 35 with spaces. Description Line 2 35 with spaces. Display URL 35 with spaces. Only the first four elements listed above will be displayed to the user. The display URL is simply the Web address users see when they view your ad. 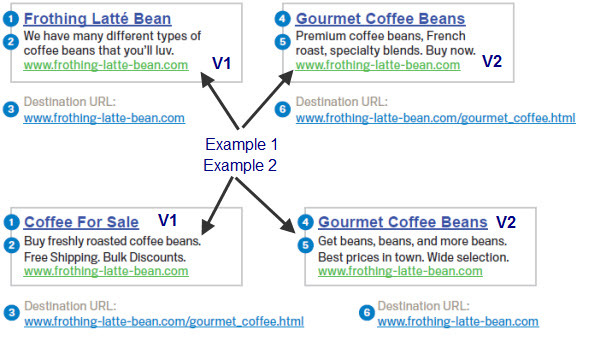 Destination URL is where users land when they click your ad and it is not visible in the ad. Display URL and destination URL don't have to be the same. However, a display URL must be an actual URL for your site. Here is an example from Google, in whichi each of the following ads is intended to sell more gourmet coffee beans. Headline focuses on company's brand name which does not have strong brand equity. Headline focuses on the specific offering and core selling points. Generic description, no call to action. Description has call to action (buy now) and has product differentiator line (e.g., specialty blends). Landing page is just the home page. Landing page is specific to gourmet coffee. Separate benefits from features. Focus on what benefit you are going to provide to your customers. For example, instead of saying "Buy New Power Efficient Furnace," it will be better to say "Go Green and Reduce Your Energy Bill." Use keywords in your ad headlines: If possible, use keywords in your headlines. If your ad is triggered by a keyword, then users are more likely to click on that ad if they see the same keyword in that ad. It increases the relevance of your ad which can improve your click-through rate. Have relevant display URLs: It is important to have user-friendly display URLs. Your users may be hesitant to click on strange looking URLs which could be mistaken as spam. Use your company's home page for display URL. Have emotional appeal whenever possible: Try to speak to your intended audience. For example, use ad text such as "Feel Confident with the Way You Look," instead of saying "Improve Your Looks."